Inspired by San Francisco, Berkeley will once again throw a giant street party; Shattuck Avenue will transform into a car-free haven for 24 blocks from Rose to Channing and from Durant to Telegraph. 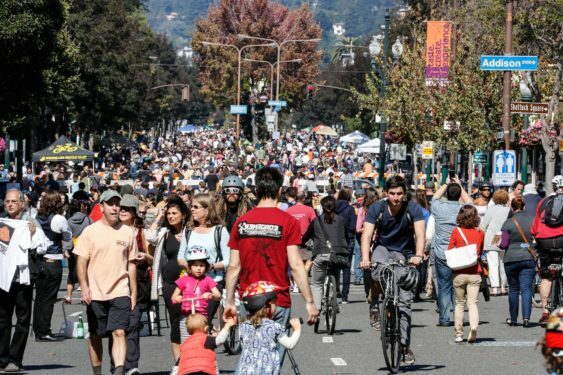 This is an epic mile-long street party where people can stroll, cycle, dance, and joyfully play (including well-behaved pets) in the closed off streets of Berkeley. Everyone from businesses and community organizations to musicians and artists use the space creatively, engaging the public and providing spontaneity and discovery. Sunday Streets (also called “Open Streets”) closes streets to automobile traffic for a day, so that people may use the space for other physical and social activities. The streets become parks as people replace car traffic. People walk, bike, skate and dance and play.